YEREVAN (ArmRadio)—“Mutual concessions are acceptable to us, but unilateral concessions in return for uncertainty are not,” Armenia’s Defense Minister Seyran Ohanian said Friday at a meeting with the faculty and staff of the Armenian State University of Economics. “By inciting border provocations, Azerbaijan tried to influence the negotiation process on the settlement of the Karabakh conflict,” the Defense Minister said. “It was a test for our armed forces, which they successfully passed,” he said. “The people of Artsakh have realized their right to self-determination on their historic lands, and there is no alternative to this,” he noted. Good. Continue to be assertive. Peace and prosperity should be a long-term goal, but to unilaterally demand only concessions from Armenia is not only outrageous and unfair, but will do more to contribute to the problem in the long term. People who win wars don’t make any sort of concessions whatsoever. They dictate the terms of settlement. Bilateral concessions should not even be on the table, let alone unilateral concessions demanded by a racist enemy whose rear ends we kicked and humiliated. 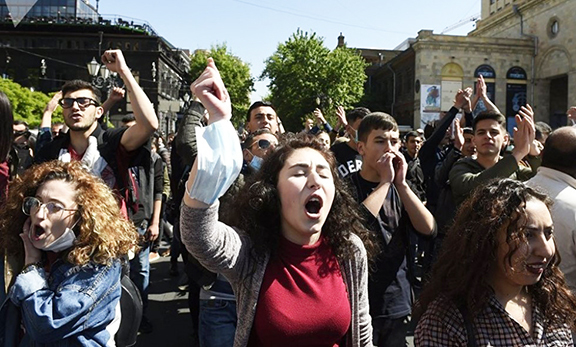 The biggest mistake the Armenians can ever make is to give into any Azerbaijani demands. Wait and see, it will backfire because the defeated, heartless and gutless enemy is flexing muscles using petrodollars and an enemy with such mentality is not interested in peace but is trying to take first steps in weakening the Armenian position in preparation for future demands and hostilities. We must not fall into their traps. We must understand that the Turks and their pseudo-Turkish Azerbaijani step-cousins-in-crime don’t behave like normal people do in conflict resolutions and that is because everything they have they stole from others like gangsters and terrorists. These criminals have very primitive approach to things and, just like four-legged creatures, perceive as signs of weakness and fear any good gesture shown by their adversaries. The Armenians must realize that neither the Turks nor the pseudo-Turkish Azerbaijani criminals are in the business of making peace with us at any loss to and perceived by them. The events in our recent and past histories can attest to that. We must deal with them from the position of strength and make it clear to the Azerbaijanis who started the war and who finished and won the war and act accordingly. As the old saying goes: To the victor go the spoils!